Phosphorene, a 2D phosphane, has been identified as a promising new material for semiconducting transistors in powerful and faster computers. One disadvantage of using this material is that many of its key useful properties, such as its potential to control electrons, are all anisotropic - they change based on the orientation of the crystal. Recently, researchers at Rensselaer Polytechnic Institute (RPI) developed a new technique to precisely and rapidly determine the orientation, using interactions existing between electrons and light within phosphorene and many other atoms-thick crystals of black phosphorus. 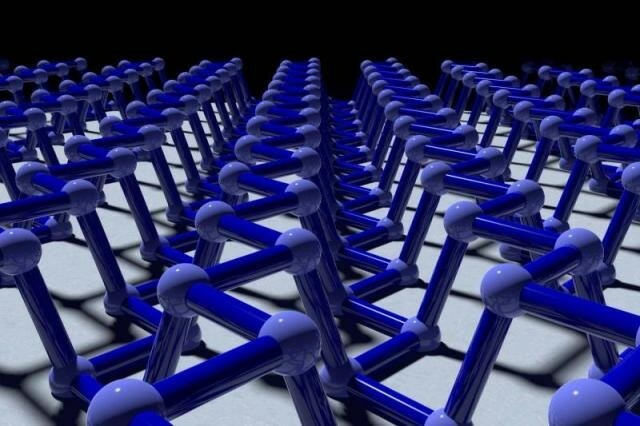 In 2014 the isolation of phosphorene, a layer of phosphorous atoms, took place for the very first time. This allowed physicists to begin their investigation on the properties of phosphorene both theoretically and experimentally. Vincent Meunier, head of the Rensselaer Department of Physics, Applied Physics, and Astronomy and a leader of the team that devised the novel technique, published his first paper on phosphorene in the same year. This paper established the structure of the material. This is a really interesting material because, depending on which direction you do things, you have completely different properties. But because it’s such a new material, it’s essential that we begin to understand and predict its intrinsic properties. Together, the researchers and Meunier contributed to theoretically modeling and predicting the properties of phosphorene. The calculations were carried out by the Rensselaer supercomputer, the Center for Computational Innovations (CCI). Through the Rensselaer cMDIS, the researchers and Meunier were able to evolve the potential of novel materials, like phosphorene, to benefit next-gen computers and other upcoming devices. The research conducted by Meunier represents the work executed at The New Polytechnic by addressing complex and critical global challenges, the requirement for true and interdisciplinary collaboration, and the application of recently developed technologies and tools, many of which are produced at Rensselaer. In this study, featured in ACS Nano Letters, the team first focused on improving an existing method to establish the orientation of the crystal. This method, based on Raman spectroscopy, utilizes a laser to calculate vibrations of the atoms in the crystals as energy travels through it, promoted by interactions between electrons and phonons. Similar to other interactions, the electron-phonon interactions in atoms-thick crystals of black phosphorus are considered to be anisotropic, and after being measured they have helped predict the crystal’s orientation. The team, while analyzing their primary results from Raman spectroscopy, identified a number of inconsistencies. To carry out further investigation, they acquired real images of the orientation of the crystals using transmission electron microscopy (TEM). The team then compared them with the results obtained from Raman spectroscopy. TEM, as a topographic technique, provides an accurate determination of the orientation, but this cannot be easily obtained like the Raman results. The comparison highlighted that electron-phonon interactions alone did not precisely forecast the crystal’s orientation. Another anisotropy of phosphorene resulted due to the interactions between electrons in the crystal and photons of light. In Raman you use a laser to impart energy into the material, and it starts to vibrate in ways that are intrinsic to the material, and which, in phosphorene, are anisotropic. But it turns out that if you shine the light in different directions, you get different results, because the interaction between the light and the electrons in the material—the electron-photon interaction—is also anisotropic, but in a non-commensurate way. Meunier stated that the team had a motive to believe that phosphorene was anisotropic based on electron-photon interactions, but they did not expect the significance of the property. Usually electron-photon anisotropy doesn’t make such a big difference, but here, because we have such a particular chemistry on the surface and such a strong anisotropy, it’s one of those materials where it makes a huge difference. Even though the invention revealed a defect in the interpretations of Raman spectra depending on electron-phonon interactions, it also pointed out that electron-photon interactions alone give a precise determination of the crystal’s orientation. It turns out that it’s not so easy to use Raman vibrations to find out the direction of the crystal. But, and this is the beautiful thing, what we found is that the electron-photon interaction (which can be measured by recording the amount of light absorbed)—the interaction between the electrons and the laser—is a good predictor of the direction. Now you can really predict how the material will behave as a function of excitement with an outside stimulus. The research, titled “Anisotropic Electron-Photon and Electron-Phonon Interactions in Black Phosphorus,” was headed by Meunier and Mildred Dresselhaus at Massachusetts Institute of Technology, and included researchers at Tohoku University in Japan, Oak Ridge National Laboratory, the University of Pennsylvania, and Rensselaer.